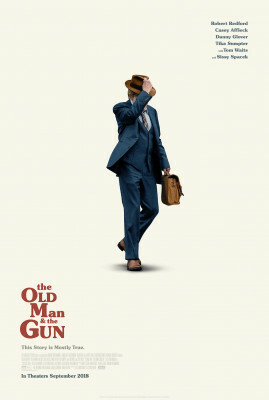 Far better than one might reasonably have expected, The Old Man & the Gun (2018), despite that awkward title, is a solidly character-driven piece based on a true story, a smallish picture surprisingly shot in Super 16mm (yet also �scope) that's charming and involving. The picture is notable as Robert Redford's final acting role. He announced his retirement from the craft prior to the release of this and Our Souls at Night, a 2016 release co-starring Jane Fonda. I hadn't seen a new Redford movie since The Horse Whisperer, more than 20 years ago, and was startled to see Redford looking every bit of his 82 years. The story, set primarily in the late-1970s, during movie star Redford's peak box office-wise, along with the brief use of film clips of a younger Redford, underscore this. Seeing him with that saddle leather face and (surely dyed?) shock of red hair, is jarring not just because he's grown so old but also the realization just how much we've aged alongside him. In a sense, writer-director David Lowery's screenplay implicitly conveys all this. It's not a great film but it is a very good one, an appropriate career capper. The film is adapted from David Grann's New Yorker article of the same name, about elderly career criminal Forrest Tucker (not the actor, obviously) who, usually with other over-the-hill collaborators, successfully robbed an estimated $4 million in dozens upon dozens of hold-ups, mostly banks, and with typically modest takes of ten or twenty thousand dollars apiece, throughout the 1970s and �80s. Tucker was also a master escape artist, having successfully broken out of prison at least 18 times using a variety of methods. That aspect of Tucker's life is tangential to the plot, which focuses mostly on the robberies, though there is a very amusing montage covering this. The movie begins in 1981, following 61-year-old Tucker's (Redford) successful breakout from San Quentin, during a period in which he criss-crosses the country pulling bank holdups with two elderly partners, Teddy Green (Danny Glover) and Waller (Tom Waits). After one such job, he stops to help an older woman, Jewel (Sissy Spacek), whose truck has broken down, and they wind up at a diner where they clearly are attracted to one another. He soon confesses that he robs banks for a living but she laughs it off, refusing to believe him. Meanwhile, an ordinary police detective, John Hunt (Casey Affleck) becomes determined to capture the wanted man after finding himself at the bank with his kids during one of Tucker's heists, initially unaware of what's going on around him. Eventually he determines the old man's identity after interviewing Tucker's long-lost daughter (Elisabeth Moss) from a marriage Tucker had long ago run out on. Mostly though, the picture is grounded in the unusual relationship between Tucker and Jewel, who slowly becomes aware that her soft-spoken beau really is a notorious, if basically harmless criminal, a rambler quite content with his life of victimless crime, who proudly has never once fired the gun he brandishes during his robberies to victims more charmed than traumatized by this gentleman bandit. The stolen money, unceremoniously dumped under floor boards, matters little. He robs banks because he likes to, and he's good at it. The scenes between Spacek and Redford have real chemistry, even radiance. Redford was always a limited actor, though good within a narrow range and carried to some degree by his looks and understated sincerity. The movie plays to these strengths and Spacek's relaxed naturalness compliments Redford. The picture's one fault, apparent once it's over, is the superfluous nature of Affleck's part, and those of his wife and kids. His is an entirely unneeded character who plays no real role in the story and is entirely absent during the climax, though his few moments with Redford, especially a chance encounter, are amusing, if minor. Indeed, Affleck's presence is so extraneous one wonders if the character was written in if only to add a marquee name under 65 to the posters. Another curious aspect about The Old Man & the Gun is its overall look in terms of costumes, hair styles, set decoration, etc. The movie seems to span the years 1981 to 2000, yet the look of the film is firmly stuck around 1975, nor do any of the characters age appreciably, despite covering nearly two decades. It's as if, and might very well be, that given the choice between historically accurate design in keeping with Tucker's life, Lowery decided it was more appropriate to dip Redford back into the world of �70s cinema, one last time. Whether the real-life Tucker was a genuinely, doggedly likeable as Redford plays him matters not for, ultimately, it's a Robert Redford Movie above all else and, by God, it works. Even projected onto this reviewer's 10-foot-wide screen, The Old Man & the Gun looked pretty impressive, despite have been shot in Super 16 for 2.40:1 widescreen. The image, to my naked eyes, really didn't look any worse than 2-perf Techniscope, and the digital finishing no doubt aided the color and other elements. The 5.1 DTS-HD Master Audio is up to current standards, though there's little aggressiveness audio-wise. Dolby Digital 5.1 mixes are available in Spanish and French, with subtitle options in all three languages. Supplements are the usual sorts of things one expects on a new release like this: an audio commentary track with director Lowery; five short featurettes, including deleted scenes, totaling about 35 minutes, and a gallery. Pleasant and rewarding, The Old Man & the Gun is definitely worth seeking out, and Highly Recommended.